Whoa! Veggie Spiralizer Nearly 50% off and FREE Shipping! Awesome Reviews! 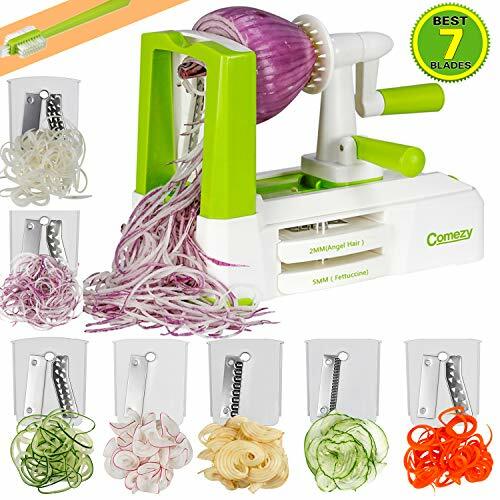 The Best Latest Design And More Slicer Tool---We guarantee to improve you spiralizer ultimate 7-NEW-BLADE what more stronger than any other,a caddy for storing blades, a user manual, and an extra cleaning brush as free gift. Premium Quality Materials More Healthy Shredder---Made from 100% BPA-free food grade FDA-approved and durable reinforced ABS plastic, high-impact plastic box construction. All 7 superior quality blades are made of a 100% stainless and Japanese 420-grade hardened steel for light and fast use.The bigger blades are easier to change，An oversized super strong suction cup can be firmly locked on the surface to ensure stable operation and much safer. Easy To Use, Work Perfectly---It's very easy to use and only takes minutes to process 2 or 3 kinds for enough noodles for a couple of people to have a healthy "pasta" dish. And all of the attachments are easy to setup, the suction cup feet secure the unit to work surface to keep it steady at your slice. Practical And Innovative---It's not only save space but also easy to clean.It's perfect for making quick low-carb, healthy veggie noodles from firm fruits/veggies like apple, onion, carrot, zucchini, cucumber, cabbage, beet, turnip, rutabaga, radish, potato, sweet potato, squash and many more. Lifetime Replacement Guarantee,Buy With Confidence---We want you get absolute peace of mind when you order .If you are unhappy with the product for any reason, you're covered by a full money-back refund. Please email to us and will get the best resolve.